Uriel is one of the four main archangels found within Judeo-Christian traditions. In Hebrew, Uriel can be translated as “The Flame/Fire/Sun Of God,” or “My Light Is God.” He is regarded as the provider of light, symbolizing wisdom and truth. Paradoxically, he is also considered “Angel of the Earth” — keeper of its depths and its alchemical properties. Hence Uriel has become the Patron of Ecology, combining the darkness and light and the inter-relationship of all life upon our planet. Milton described Uriel as the “sharpest-sighted spirit of all in Heaven,” and the “Regent of the Sun”; Emerson wrote a poem entitled “Uriel”; and Longfellow cited him in his translation of “The Golden Legend.” Haydn’s oratorio, “The Creation,” casts him as the third angel. Even so, he is regarded as a saint in both the Eastern Orthodox and Anglican traditions, with his iconic symbol being that of an “open hand holding a flame.” He’s the Patron Saint of the Sacrament of Confirmation in the Anglican Church. In lofty circles play and hover thro’ the sky the cheerful host of birds. And in the flying whirl, the glitt’ring plumes are died, as rainbows, by the sun. He is often shown holding a scroll representing wisdom and is viewed as the patron of the Arts. Meet Uriel the Angel of Wisdom. Please share your links (use the reply box below). 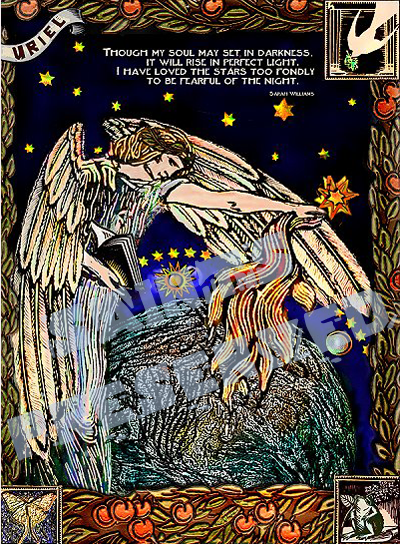 Our Archangel Uriel is available in many media, including cards, jewelry, prints and more. Visit PartriArts Gallery to view them. Website of the Church of St. Uriel the Archangel Church, an Episcopalian parish and one of the very few parishes dedicated in honor of St. Uriel in the United States. Thank you! It looks like a lovely church. We’ve included a link above. I am curious as to how this church was named. I am a practicing cradle Episcopalian. I have been researching angel lore in apocryphal, kabbalistic,​ and scripture. I am especially interested in Uriel. Perhaps you may be able to enlighten me further?